I was well and truly excited about this event. My recovery seemed to be going well from last weekends Ultra-marathon. I had a busy week at work so this festival of running was going to be a lovely stress reliever. 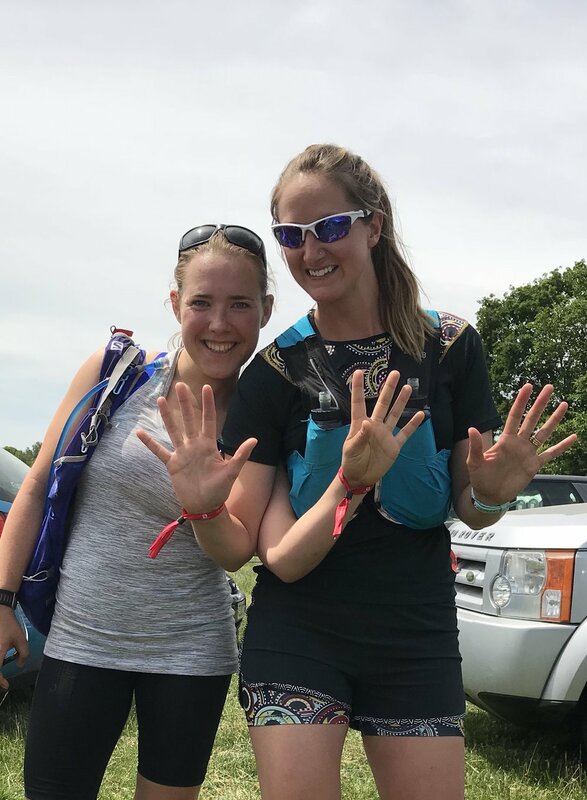 I was meeting up with fellow runner and friend of mine Adelaide Goodeve to take part in all of the the activities that were on offer throughout the festival and complete the 20km trail run. We had signed up for a trail running workshop, yoga, a guided run with an athlete and also the timed 20km race. The event was taking place at the foot of Box Hill in Surry. It was the most glorious sunny day and our first activity was booked in for 9am. We were heading out for about an hour with a small group of runners and a Salomon sponsored athlete to learn new trail running skills. He mentioned how much there was to learn and weeks could be spent learning all of the different techniques, he however had one hours to improve two key running elements - up hill and Down hill! Being an Ultra runner it isn't really very often that I run up steep hills; I take the opportunity to walk and change my muscle, I was therefore a little sceptical. However, I persevered and tried to be a great running student, listening to all that Sam (Salomon athlete) said and tried my very best to copy it. He just seemed to float up these hills, I am still more on baby elephant scale. I will get there, I just need to remember to be up on my toes, keep my head up, arms relaxed, chest open and breathe from the belly. Simples. We then started to learn about running downhill. This is something I have struggled with, I wouldn't say I am really slow but I defiantly hold back; I was listening in intently as I really want to become a demon at running down hill. This is when I realised I have been doing it all wrong! Again the body must be relaxed, the arms out further from the body, arms can be used like an aeroplane for direction if needed, slightly lean the upper body forward and then scuff the feet. This was a whole new technique to me, scuffing the balls of your feet everytime you take a steep down the hill allows you to keep control and also acts as a break. It was really fun to practise and feel like a bit of a wally having aeroplane arms. I liked the scuffing technique originally but then it starts to hurt my toes. After a long decent my feet moved forward in my trainers and I could feel them hitting the front. I don't think this would be the appropriate technique for an ultra-marathon but I will keep practising. One of the very big hills! It was becoming a scorcher of a day, I had my Salomon Slab vest on that I love and it holds just under two litres of water without really being noticed. I was trying to stay hydrated conscious that I didn't want to be dehydrated for the 20km run coming up. Just after the trail running workshop we were getting ready to run the guided 20km route. Again we were being shown the way by a Salomon athlete in groups of about 20. It was really lovely to be running with a small group and not in a 'race' situation. The pace was steady and the hills were big, my legs were heavy still from the Ultra marathon but I just kept practising the trail techniques, kept chatting and smiling and taking in the views; if I stay positive the kilometres seem to fly by. As it was a guided run the over all pace was slow as we kept waiting for group members and also taking lots of photos. This is a positive of trail running, it isn't all about the times and how fast you can run it is about the experience, taking in the views and being part of the natural surroundings. There were 7 big hills to run up on the 20km course, I feel like I know Box Hill well now. It is a beautiful place to visit and lovely to run around. At about 14km most of the group had run out of water; we thought there would be a water station at the half way mark but sadly that was not to be the case. We found out that the water stops would only be available in the timed race later in the afternoon. However, supplies were called for and a 4x4 turned up in the nick of time down a narrow lane to fill all of our water bottles. A couple of people had tripped over roots at this point so also needed a little bit of first aid. With only 6km to go and my water re-filled I felt like I was just warming up and getting into it, the last 6km were my most favourite, I felt good and strong and was having a great day running in the sunshine. As it was a guided 20km there wasn't a big fan fair at the end or medals but just a lovely atmosphere. A couple of people on the guided run had never run that distance off load before. It really felt like a nice community. By the end my legs were really heavy and it was going to get warmer throughout the day, I was glad to be finished and to be able to enjoy the rest of the day. It was now lunchtime; there were loads of healthy options to try and some of the best juices and smoothies ever on sale, it was nice to sit down and re-fuel listening to some talks on the main stage from more incredible athletes. After a relax we went and joined in with the free yoga sessions to stretch our muscles. It is always lovely to be able to practise yoga outside in the fresh air. There was also massage on offer; I just couldn't resist. I went along to the massage to ask to get my very tight left calf looked at. I didn't think I would however get tortured by some strange compression devise! I am not sure if I would ever recommend it again but it was definitely an experience. Throughout the evening there were the timed trail events and then a bar and music in the barn. :) An all round perfect day. This event I will 100% be going to again. The ticket prices were minimal, there was so much to do and it was great fun.